This Dragonknight maily cast magic damage. And he can cause Buff effects in battle. So this is a good choice to start the adventure in The Elder Scrolls Online. 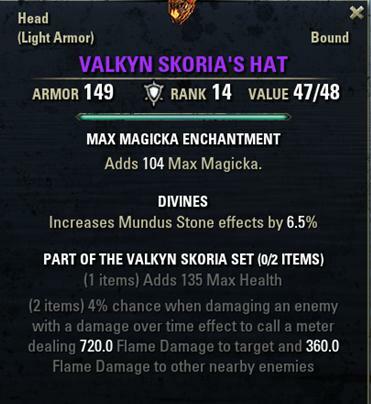 Valkyn Skoria (two items)- to add Mundus stone effecrts by 6.5% and 4% chance when damaging an enemy with a damage over time effects to call a meter dealing 720 Flame Damage to target. Twlight's Embrace (three items0-to add 141 Max Health and spell critical by 4%. Ather Sash (three items)- to add 8% of spell critical. All TESO armors are enchanted with magic enchantment. The leg is Infused and others are Divines ( It depends on you what enchantment you use). To get the effect of the passive skill Undaunted Mettle, please equip Dragonknight with five Light Armors, a Medium Armor and a Heavy Armor. Jewels: three Soulshine- to add 77 Max Magicka and 4% spell crit. Cinder Storm can cause effect. Keep the effect of Flames of Oblivion and Inner Light. During the time of casting DOT, you can use CS to cause damage.